NOTICE: Activation key must be used on a valid Steam account. Requires internet connection. About the gameWhen Quinn wakes up alone in a locked room with nothing of note save for a computer hooked up to an internet chat room in which you're present, you become his single ray of hope. Your choices – and your timeliness – will single-handedly shape his escape efforts… or lead him down the… path to an untimely end. Key Features The Clock Never StopsSTAY plays out in real-time, meaning that every minute spent away from the game is a minute Quinn is left alone. Drop out of conversations or leave Quinn to fend for himself for too long and there may be consequences.Raise Your EmpathyQuinn is on edge, and so every response matters. Prove yourself a compassionate ally and he’ll learn to trust you and share his findings and deepest thoughts. 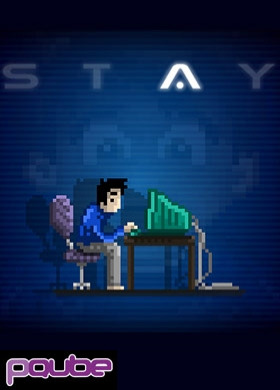 Fail, and his emotions may work against you.Interactive StorytellingFeaturing 24 chapters, seven different endings, dozens of potential deaths and entire webs of conversation, STAY is designed to be replayed multiple times. Explore different rooms and unearth hidden secrets in subsequent playthroughs to piece together the full story. Uncover The TruthWebcams enable you to spy on Quinn, letting you see both his reactions to your comments and his actions while AFK. Pick up on his lies and use that knowledge to your advantage.Solve Mind-bending PuzzlesHelp Quinn get the better of the conundrums he encounters inside his prison by taking direct control of his actions during puzzle sections. System Requirements Windows - Minimum OS: Windows 7, Windows 8, Windows 10 Processor: Intel Core i3 or AMD Phenom ii X2 Memory: 4 GB RAM Graphics: Nvidia 8800 GT, AMD 5670 DirectX: Version 9.0 Network: Broadband Internet connection Storage: 1 GB available space Windows - Recommended OS: Windows 7, Windows 8, Windows 10 Processor: Intel Core i5-2300 or AMD Phenom II X4 940 or better Memory: 8 GB RAM Graphics: SM4 1GB VRAM DirectX: Version 11 Network: Broadband Internet connection Storage: 1 GB available space © Appnormals Team. Published by PQube Ltd. All rights reserved.